Runners can get Hat Tricks too! 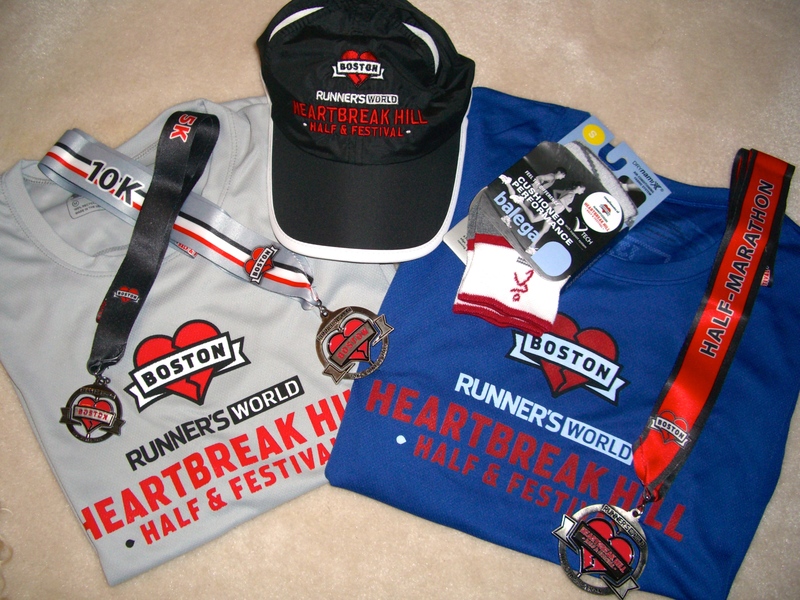 Last fall I received an email from Runners World magazine announcing their inaugural Heartbreak Hill Half and Running Festival in Boston. They have been holding a similar running festival in late October in Bethlehem, PA for a few years. There are seminars, a pasta dinner with editors from Runners World, and races for everyone including kids and dogs. Runners can choose from a 5K, 10K and half marathon. If you run both the 5K and 10K, they call it the Five and Dime. Running all three races is called the Hat Trick. The Boston festival was going to have the same format with the added attraction of running the famous Heartbreak Hill from the Boston Marathon course. For me there was no way I was going to pass up this running festival. First, it was an inaugural event. There is only ONE inaugural event for anything and I wanted to be there. Next, it had those funny names – Five and Dime, and Hat Trick. Funatical runners like myself – runners who race to have a good time – are suckers for races with amusing names. Last, two of the races included Heartbreak Hill, the famous hill on the Boston Marathon course. The Boston Marathon is the only major marathon in the world that you have to qualify for. Even if I live as long as Harriette Thompson, the 91 year old marathon runner, I will never qualify for the Boston Marathon. This was my only chance to run on part of the most famous marathon course in the world, even if it was on the Heartbreak Hill. I had plenty of time to train for races in June so I hit the Register button. The one thing about marathons is that there are typically many months between the time you register and when you toe the start line. Lots can happen in between. And unfortunately for me, it did. I suffered a concussion in an auto accident in February. For six weeks, per my doctor’s orders, I didn’t run a step. I started training again in late April with a personal running coach, Jenny Hadfield, but my training was not where it normally would be for a multi-race event like this. When I arrived in Boston for race weekend on Friday and went to pick up my race bib at Boston College, I started to get a feel for the Newton hills. I was intimidated. I sent an email to my running coach with the subject line “Having a panic attack” (I figured that would get her attention) and asked her if I was ready for this Hat Trick thing. She replied “Absolutely” and gave me a strategy for the three races. With her reassurance, I looked forward to the next two days of running. On Saturday I got through the 5K with no trouble. An hour later the 10K started. The 10K course was more hilly but I followed Coach Jenny’s advice – follow my body more than my watch; run down the hills where gravity would help with the work and walk up hills where I needed to. After finishing both races, I was surprised that my pace was nearly identical for the two races. Five and Dime done! Before the start of the race on Sunday, I was still nervous. Then the horn sounded and we were off. I may have thought that I was not prepared for this race but the other runners that I saw as I ran put me in my place. In the first mile I came up behind a man wearing a shirt that said “Colon Cancer 2009, Brain Cancer 2013, Tough to Kill, Harder to Stop”. He was doing pretty well and we ended up running a good bit of the race together. About a mile later, I came up behind a man wearing a shirt that said “Life Begins at 70”. I had seen him before the start lathering himself in something that smelled like BenGay or Tiger Balm. You could smell him from 20 feet away. When I got along side of him, I asked if he had started running when he was 70. He said he had – and now he was 76! I kept going and around Mile 4 I saw an attractive young woman with her blonde pony tail bouncing as she ran. She was running with a prosthetic leg. She had a big smile on her face too. Watching these three runners made me think. I really didn’t have a reason for a panic attack. These runners were facing more challenges than me and probably didn’t have a coach to email for reassurance. Running on part of the Boston Marathon course gave me energy. These were the same streets that my running idols, like Meb Keflezighi and Joan Benoit Samuelson, have run. In my mind I was on hallowed ground. I finished the half marathon in the time that I wanted. My pace was nearly the same for all three races. In fact on Sunday, I was just a little faster. Hat Trick done! I was brave enough to go to the start line three times in two days even though I was intimidated by the Newton hills and didn’t think I had enough training. I was strong enough to take on Heartbreak Hill and beat it – twice. I was smart enough to follow my coach’s race strategy and not let my fears cause me to make mistakes. I may never run the Boston Marathon but the Heartbreak Hill Half let me experience just a little bit of one of the most prestigious marathons in the world. P.S. If you think you would like to start running – even a 5K – check out Coach Jenny’s web site!